Peregian Nippers sport their new uniforms at their end of season celebration on the top floor of the surf club. 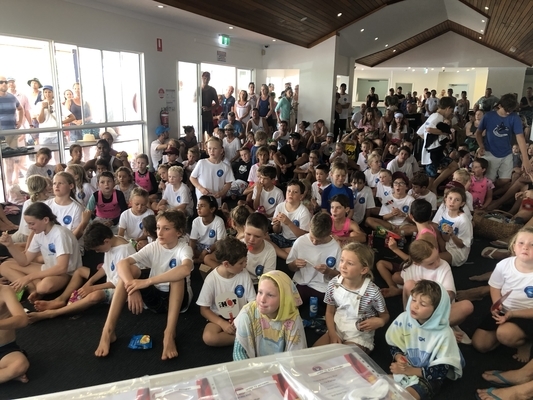 While about 110 nippers celebrated the end of their season at Peregian Beach over the past two weekends the future occupancy of their clubhouse is under a cloud after Noosa Council voted at last Thursday’s Ordinary Meeting to call for Expressions of Interest (EOI) to lease the top level of the surf club. At present Surf Life Saving Queensland (SLSQ) work with affiliated club Noosa Heads Surf Life Saving (NHSLS) and associated group Peregian Family and Friends (PFaF) to provide surf lifesaving services and a nippers program. SLSQ CEO met with Mayor Tony Wellington prior to the meeting and wrote to councillors saying not having access to both levels of this building and no long term lease may affect the viability and sustainability of a Peregian Beach Surf Lifesaving service. SLSQ have reserved their decision to submit an EOI, saying they “will await the terms of the EOI before making a decision whether to submit an application“. “Our core focus remains on ensuring the continuation of lifesaving services and a nipper program at Peregian Beach and the safety of beachgoers,“ they said. PFaF president Kane Livingstone said they were concerned none of the current users of the surf club had been consulted before the EOI was issued.“Our position is that the building was built by lifesavers for lifesaving,“ said PFaF secretary Leigh McCready who believes one of several flaws in the EOI process is omitting the requirement it be for surf lifesaving. “Our organisation will not be putting in an EOI, because we believe the only group which should occupy any part of the surf club building is an affiliated surf lifesaving organisation,” she said. At the Council meeting Councillor Ingrid Jackson raised questions about the legality of council’s ability to lease part of the building as the original government gazettal for the site dating from 1987 was as a “reserve for local government (surf lifesaving) purposes“. But Council holds the position as trustee of the building which has no formal tenure over it, Mayor Tony Wellington said. Despite being told by SLSQ its aim, with a long term lease, was the rebuilding of a community surf club and the whole building was required for lifesaving activities Council has accepted reports from “residents“ that the building is “under utilised“. 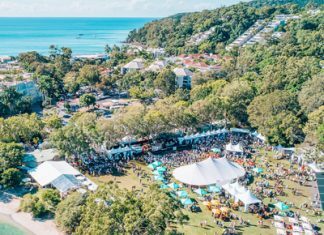 “In the long term, Noosa Council wants to see a locally-based, viable surf club operating out of the Peregian building,“ he said. “But these things can’t happen overnight, and the outcome of the EOI process will need to consider how best to progress towards this ideal,” Cr Wellington said. Council said applicants must demonstrate how their proposed use of the building complements or aligns with the gazetted purpose as a reserve for life saving, but does not specify surf lifesaving. “It is my hope that this process will draw a line under the ongoing debate between various community groups about best use of the building,” Cr Wellington said. The move by council has not heralded community unity but those who have applauded the EOI decision have included Peregian Beach Community Association led by president Barry Cotterell who said they “continue to fully support lifesaving and nippers on the ground floor, just as it has been, but we want to see the top floor activated again by the local community”. Incorporated group Peregian Beach Surf and Lifesaving Club, which is led by former NHSLS member president Rob Neely and is not an affiliated lifesaving club welcomed Council’s motion and aims to submit an EOI. Rob told the community last year his group had a 10-point strategic plan to operate the surf club in its current though architect renovated building, to get lifesaving and a nippers program running, funded with proceeds from Peregian Beach markets, Surf Lifesaving Queensland contributions and fundraising activities. He said the group planned to include oceanography elements into the club for nipper education, whale watchers and tourists but expensive elite training activities would not be included in the club.